Polaroid & Analogue Photos New Zealand: The House that Polaroids Built? The House that Polaroids Built? edward and after that, when did the house start becoming adorned with the polaroids? kim it became “The Polaroid House” on June 9, 2008, when jena, chinako and i went out there to leave my polaroids. edward what was the concept of the house? how did you see it as a medium for art? kim the concept revolved around the recent demise of polaroid film. i love polaroids and that announcement came as a shock. 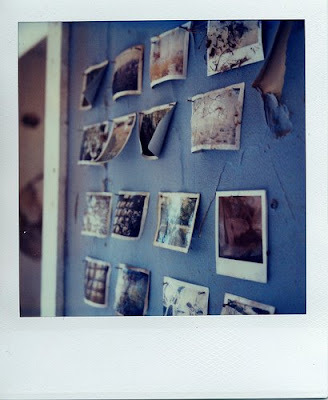 so the house was a tribute to polaroid and the slow decay of the past. edward since then, how many times have you visited the house? I was all set to go on a group visit to the house with these guys back in April when I was visiting the states, but the day before we were set to go (SERIOUSLY), the trip was cancelled. Turns out the lady who owned the house contacted Kim, and no longer wanted the project to continue for various reasons. Unfortunate!